Savierra Railings is proud to offer a perfect combination of the two new powder coating technology now allows for stunning wood grain print to be set into aluminum railings. Whether it is the top and bottom rail in a glass system, or the individual pickets, the beauty of wood can now be enjoyed maintenance-free for years. Savierra also offers the system in traditional black or white, and in custom colors. Relatively easy to install, 'hands on' home-owners and 'Do It Yourselfers' can successfully complete an install on our Classic Line in one to two days (depending on deck size). The top mounted system is strong and and is guaranteed to hold up to the weather and heavy use for years to come. Elegant: Built to stay that way! 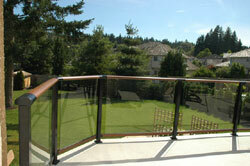 All railings are pre-finished with a baked on acrylic melamine finish, similar durability to your car. Not only are railings extremely low maintenance, their computer-controlled, custom construction means installation in minutes. Nothing stands in your way: The wonderful new Sea-View is essential for beach front, hill side, or high rise vistas. 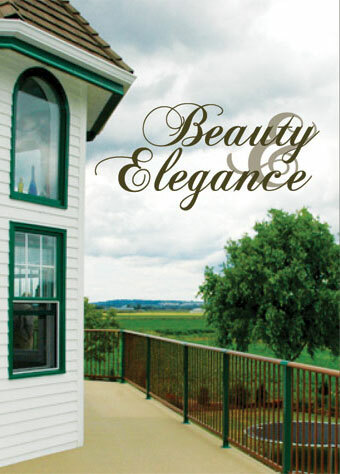 Strong tempered glass and aluminum provide minimum obstruction of "million dollar views".